Oh hello everyone. Excited! I am! Today is the release day at Taylored Expressions. All the new products we have been showcasing for past three days are now available at Taylored Expressions Store. I am sharing with you couple of projects with you today using the new products. 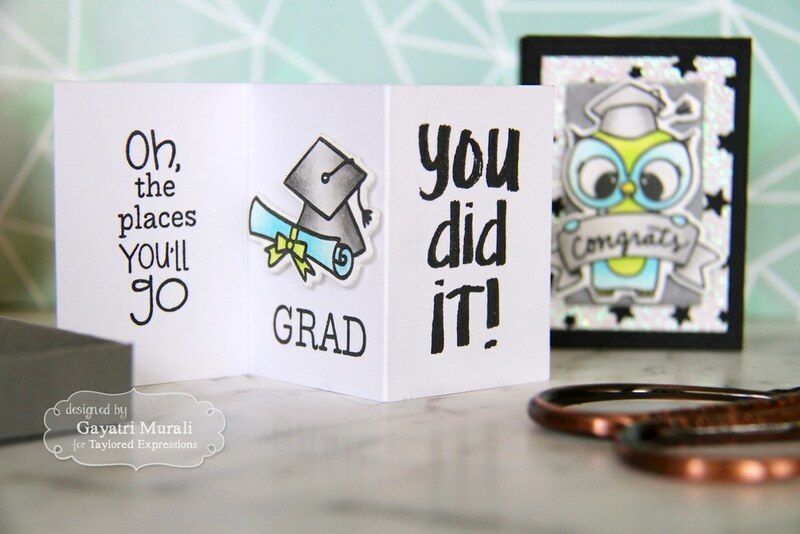 First up I am showcasing Matchy Matchy Grad stamp set and dies along with Matchbox die release last month. 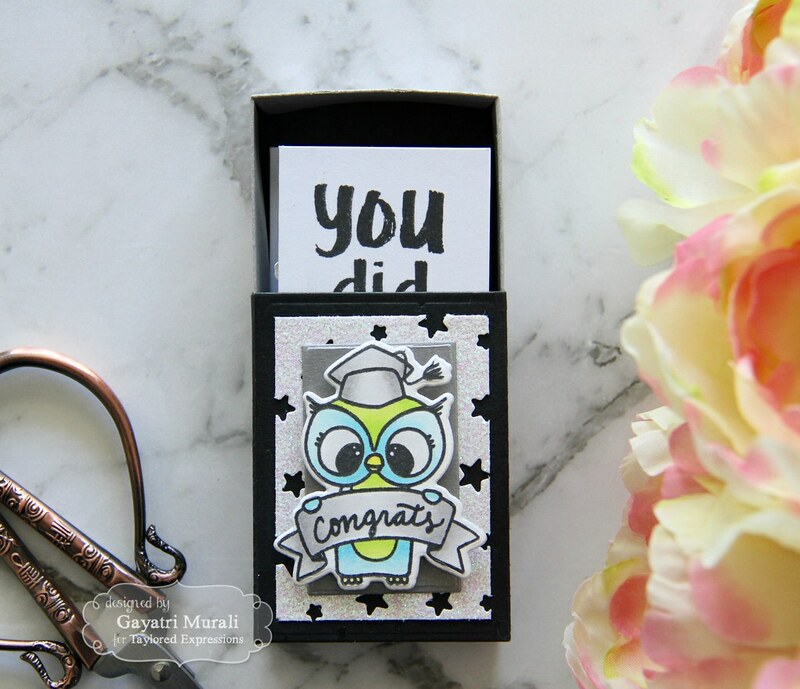 I made the match box using Oreo cardstock and silver cardstock. I then measured, trimmed and scored Sugar Cube cardstock to fit inside the matchbox. I made an accordion fold on the score lines. 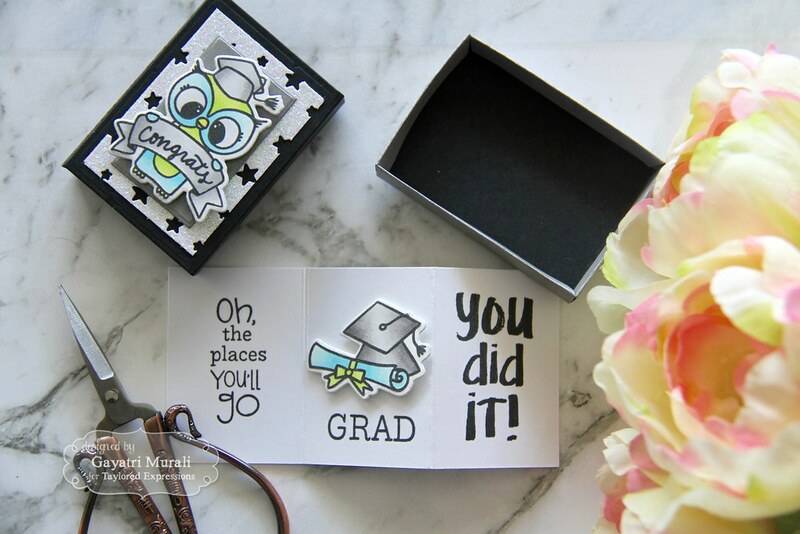 Stamped on either end on both sides with the sentiment stamp from Matchy Matchy Grad stamp set using Oreo Ink. On the middle I adhered the hat and scroll image from the stamp set. On the cover of the match box, I trimmed silver glitter Starry Night die cut and layered with another piece of silver cardstock. 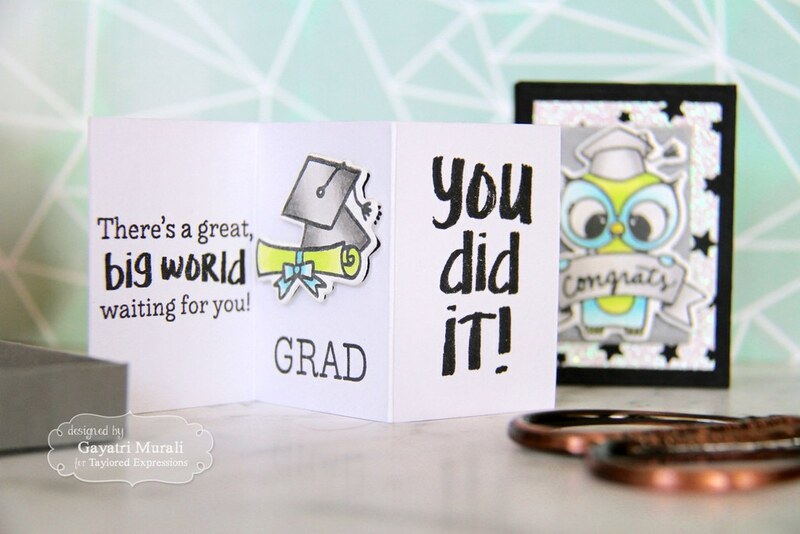 Finally I adhered the coloured image die cut from Matchy Matchy Grad stamp set. All the supplies used to make this matchbox are listed below. The second project I am sharing with you today uses a background stamp called Brushed Star Background. 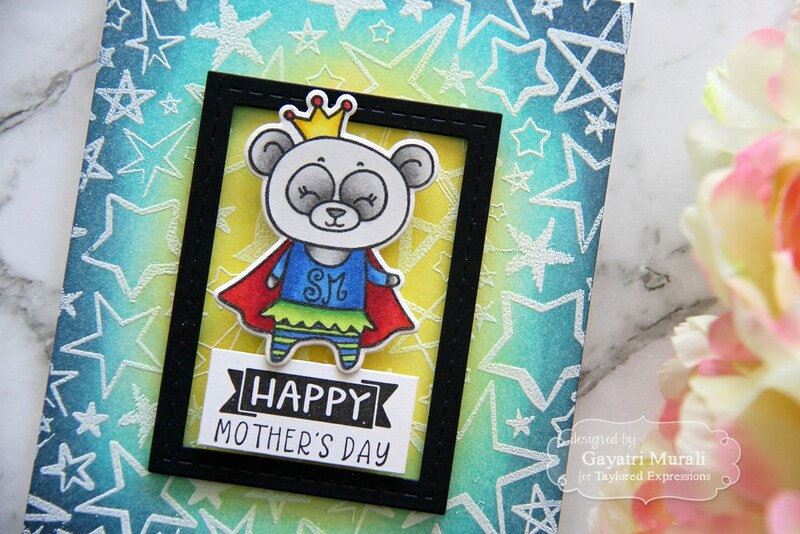 I have combined this stamp with the new SuperMom Stamp and Die combo to make my card. I did emboss resist for the background using the Brushed Star background stamp. I sponged TE dye inks – Potato Chip, Lemon Meringue, Sprinkles, Cookie Monster and Blue Corn. The yellow ink at the centre gives a nice glow. 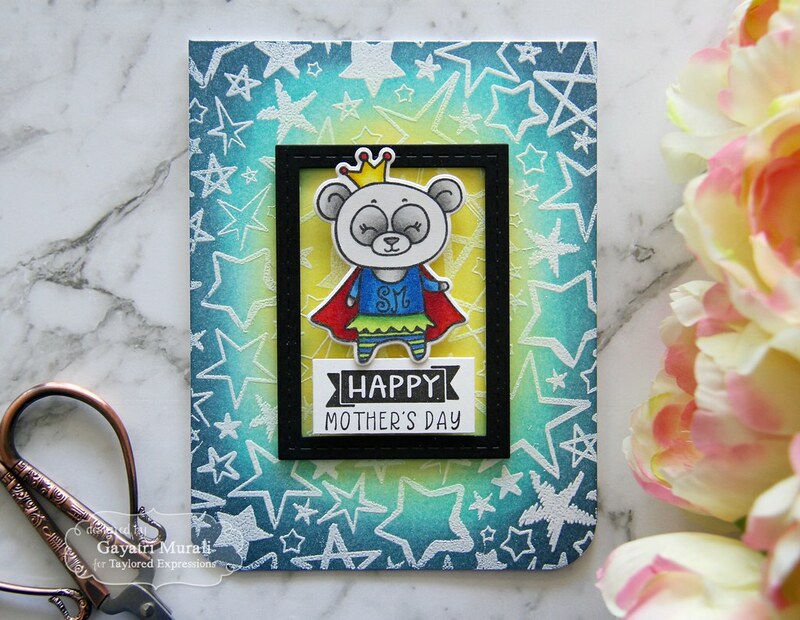 The focal point has the panda from SuperMom stamp set. I stamped, copic coloured and die cut the cute panda and adhered to the centre of the background panel. 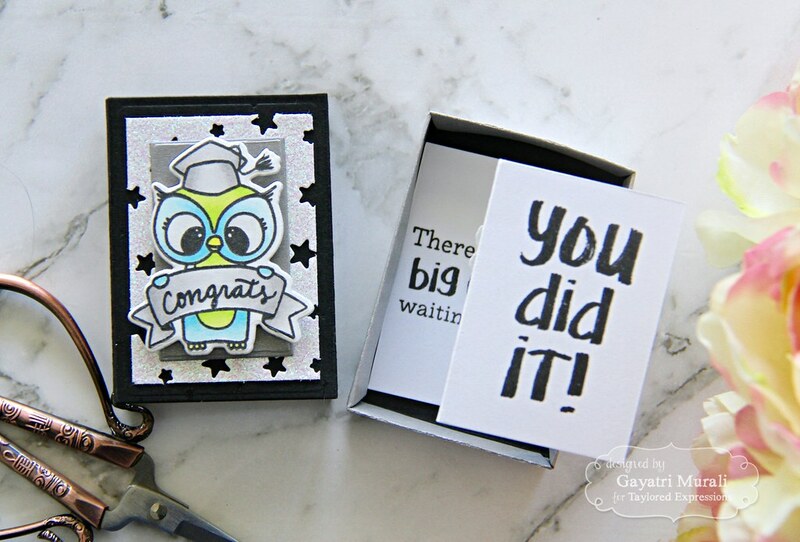 The sentiment is simply stamped on a strip of Sugar Cube cardstock using Oreo hybrid ink. Then I felt the focal image and sentiment needs to be framed. So I added a black stitched rectangle frame using Oreo cardstock and Frame in Frame 2 dies. The frame makes the focal image pop out of the busy background. Hope you liked all my projects this release. All the new release products are now available at Taylored Expressions store. Happy Shopping! 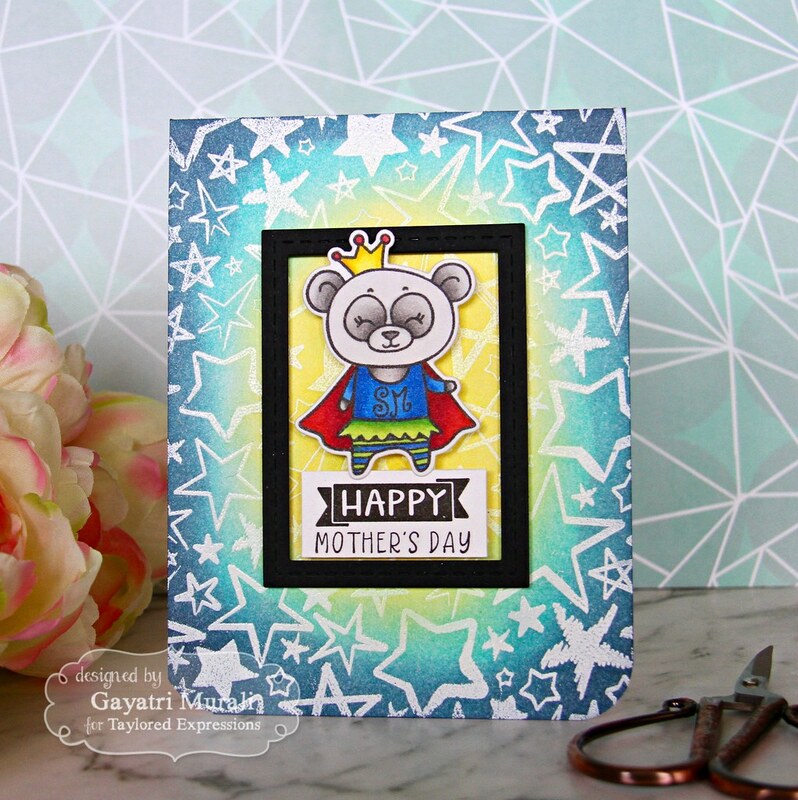 Adorable cards–love your coloring on the first one! Oh my, these are so fun! !